See how Woodall & Woodall's practice has transformed since partnering with Ascend for full inbound services. 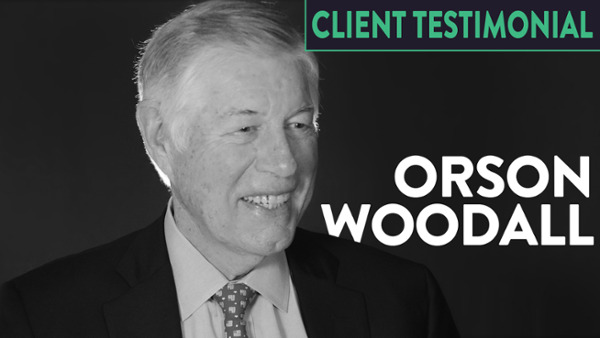 Orson Woodall is a veteran bankruptcy attorney that has successfully filed over 22,000 cases. 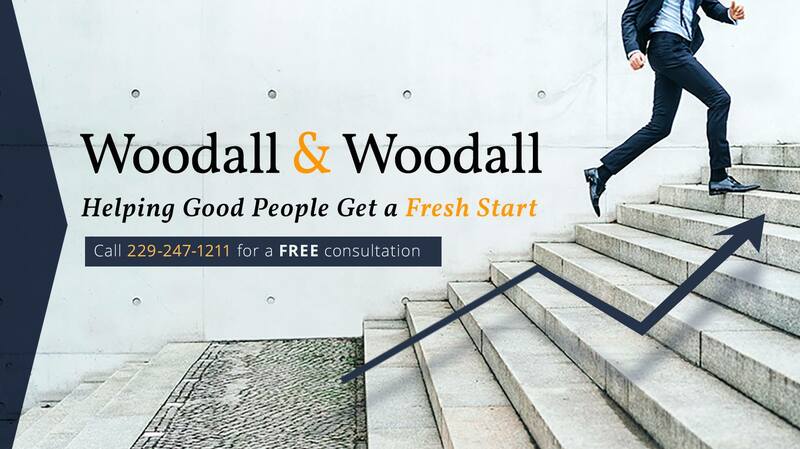 The mission of his firm, Woodall & Woodall, is to help his clients break free from financial worries and creditor harassment and achieve financial freedom. Orson's story is uncommon. He started his career in radio advertising, but after losing everything, he went back to school to become a lawyer. Knowing firsthand the burden of being in debt, Orson set out to help people in situations similar to the one he was in. Over the last 25 years, he's built a successful bankruptcy law practice in the heart of south Georgia. Bankruptcy law is a competitive, hyper-local service, and Orson knew he needed to make changes to take his business to the next level. Like any business, Woodall & Woodall juggles competing priorities that pit day-to-day operations against achieving long term, strategic goals. It's hard to get ahead when you're bogged down in doing the work to run your business. With his background in advertising, Orson has a deep understanding of the metrics involved to measure the success of his marketing efforts. For many years, he found success in the Yellow Pages, television, radio and billboard ads. But as buyers became more savvy and moved to the internet, he found those efforts becoming increasingly less effective. He moved some of his efforts online and started seeing good results from pay-per-click ads, but those results didn't last. In 2016, he found himself spending thousands of dollars a month on ineffective PPC ads that delivered little in terms of ROI. After years of trying to manage his advertising efforts himself (in addition to running his busy practice), Orson knew he had to make a change. Woodall & Woodall was looking to improve lead generation, automate follow up, and increase customer conversions, all while making sure the firm stood out from the competition. Additionally, audience targeting and messaging is critical when it comes to the bankruptcy field. This is not only for legal reasons, but also because this is a very difficult time in the life of potential clients. Attorneys have to make sure they are working with the right clients in order for cases to be successful. Orson's experience in the radio industry meant he was aware of new marketing tools available to help solve these challenges. However, he didn't quite know how to evaluate which were the best fit for his firm or how to implement and manage them effectively. That's when he called Ascend. Woodall & Woodall's practice has transformed since partnering with Ascend for full inbound services including strategy, website design, content marketing and conversion optimization. 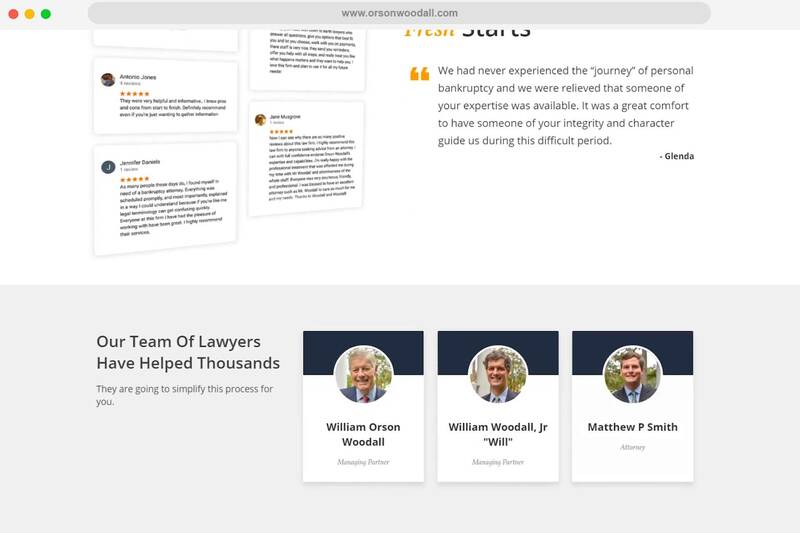 We started by crafting buyer personas for Orson's clients, creating truly meaningful content, and developing a series of workflows to nurture them as they pondered the tough decision to file bankruptcy. Once Woodall & Woodall takes on a client, they are entered into persona-based client follow-up workflows that send them important reminders about paperwork, appointments and court dates. There are also administrative-based workflows that remind employees via email and text to follow up with clients as well. 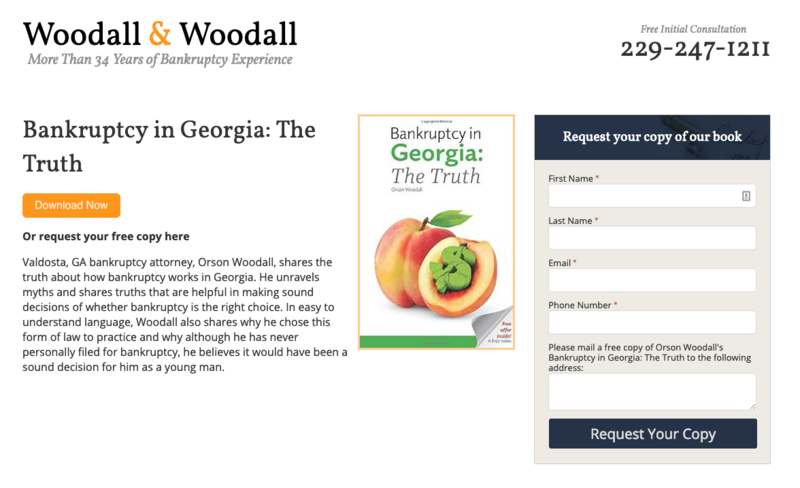 We built Woodall & Woodall a new website on the HubSpot CMS and custom-developed a quiz that helps visitors determine if they're eligible to file for bankruptcy. By "gamifying" the lead generation process, we've seen over 700 leads come in on this offer alone. Additionally, through multivariate testing, we've improved the conversion rate of the offer from 15.84% to 19.15% over time. 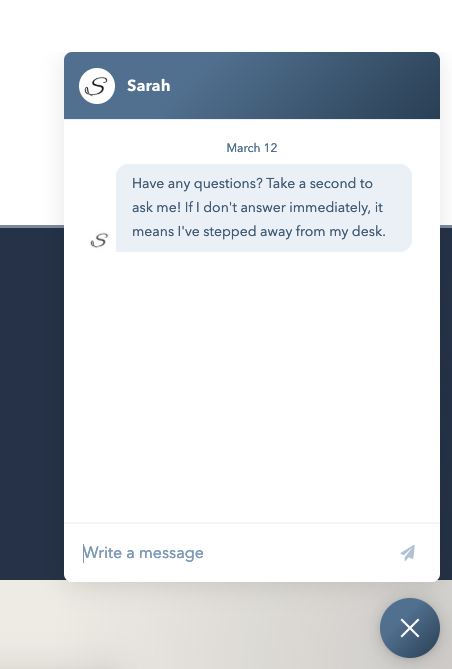 The website also features live chat that connects visitors to an intake specialist to answer their questions in real time. Since bankruptcy can be a sensitive topic for folks, chat provides a frictionless way for leads to reach out. Live chat alone has brought in 218 leads over the last 9 months. Throughout our partnership with Woodall & Woodall, we have developed a content marketing strategy with the goals of educating the site's visitors about their options, and increasing qualified traffic from organic search. The content strategy centers around educational blog posts and engaging video. 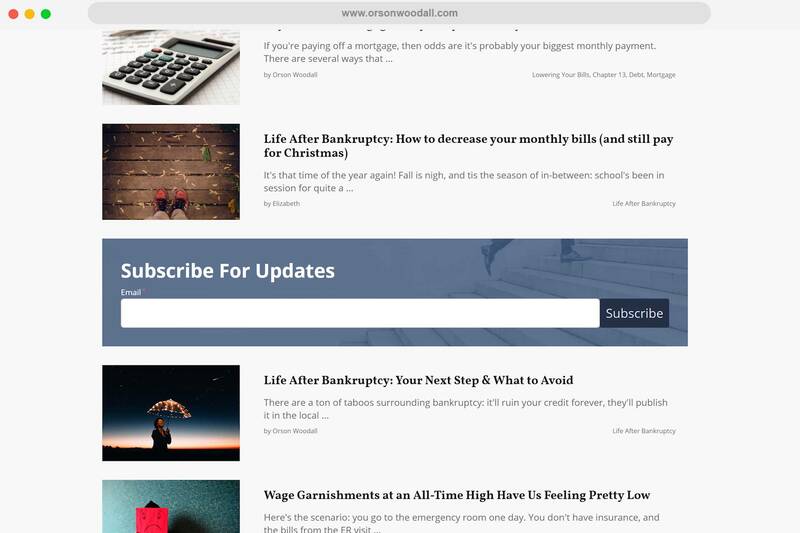 Woodall & Woodall's blog was even recognized as one of the Top 100 Bankruptcy Blogs to Follow in 2019. The blog has generated over 1,400 subscribers. For clients who have recently completed their case filing with Woodall & Woodall, we have created workflows to ensure they had a positive client service experience. 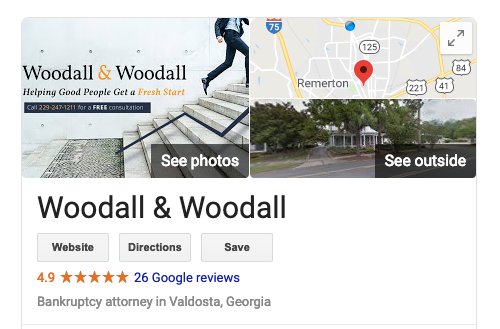 Through our reputation management workflows and followups, Woodall's practice has garnered more positive local reviews than any of his competitors (by far). We took things a step further with Woodall & Woodall's inbound strategy by developing a client hub for their existing clients. 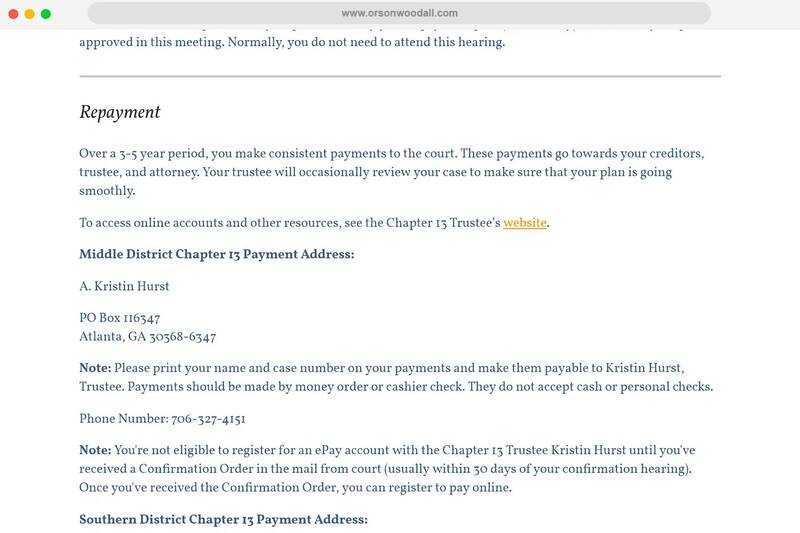 This area of the website contains useful documents, courthouse contact info, and information about what to expect after filing for bankruptcy. Since implementing the client hub, Woodall's practice has seen a substantial decrease in the number of phone calls from clients asking common questions. This saves staff time that they can instead use to focus on following up with current leads. "Ascend has taken our marketing and turned from a 'touchy-feely' thing into a science. We know exactly what's working and what's not." Paid advertising and PPC still play a vital part in Woodall & Woodall's lead generation strategy, but we have been able to decrease his overall ad spend by half, and reduce his cost-per-conversion by 31%, all while growing his overall client base. The gap was filled by largely by an increase in customers who originated as leads from organic search. Since the beginning of our engagement, the top source of customers has changed from client referrals to organic search. In the last year, that number has grown by 25%. Overall, in the last year we have seen traffic increase by 81% and leads increase by 643%. Furthermore, Mr. Woodall says his client retention rate has almost doubled since partnering with Ascend.